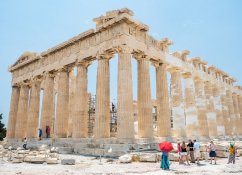 Discover the "Temples of shopping"
New times, new religions. 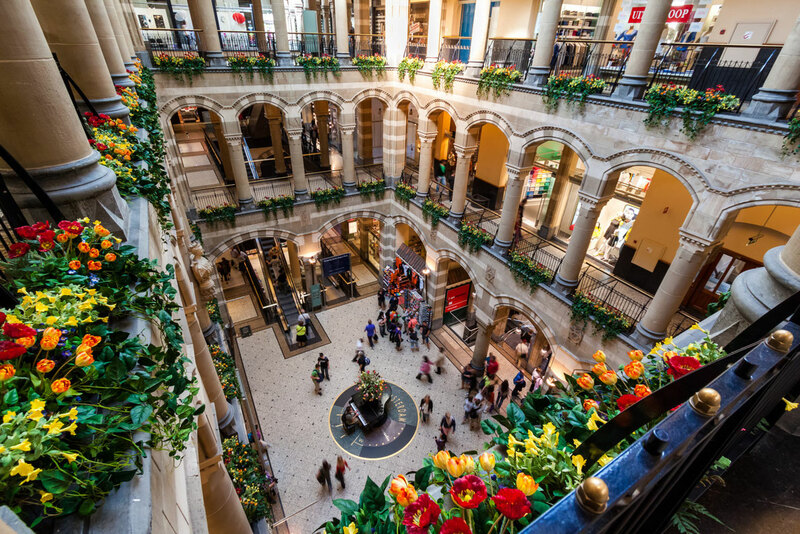 Discover the “temples of shopping” in Europe. 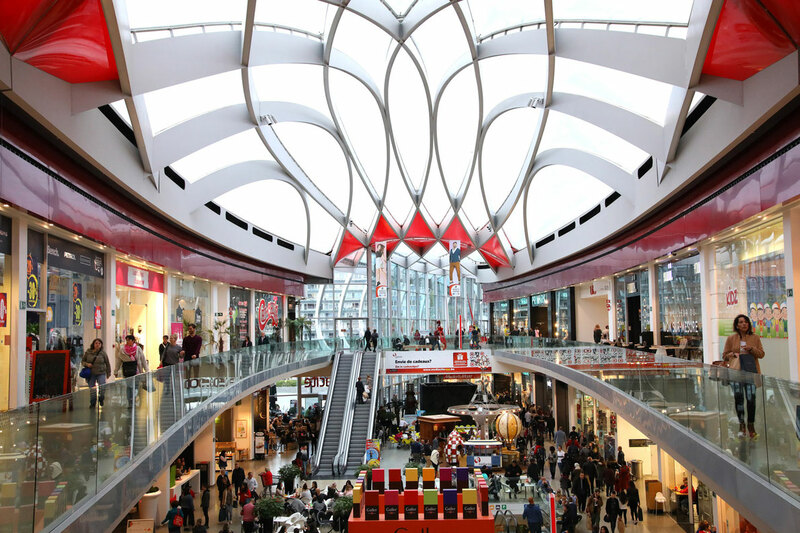 Here is a selection of shopping centers not be missed during your visit in Europe. 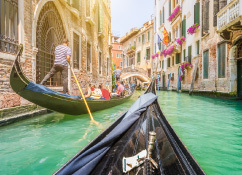 Visit historic and world famous shopping centers such as The Galeries Lafayette in Paris and Harrods in London, shopping centers with bold architecture as Vulcano Buono in Naples or Kanyon in Istanbul. 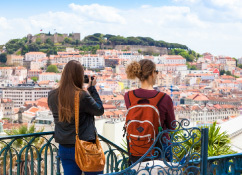 Book your hotel, guesthouse, B&B or apartment at the best price guaranteed and discover the best shopping centers in Europe! The Galeries Lafayette is an upmarket French department store company located on Boulevard Haussmann in the 9th arrondissement of Paris. In 2009, Galeries Lafayette recorded earnings of over one billion euro. The Haussmann location, which serves as the flagship store of Galeries Lafayette, is a 10-story structure located at 40, boulevard Haussmann, in the IXe arrondissement of Paris. 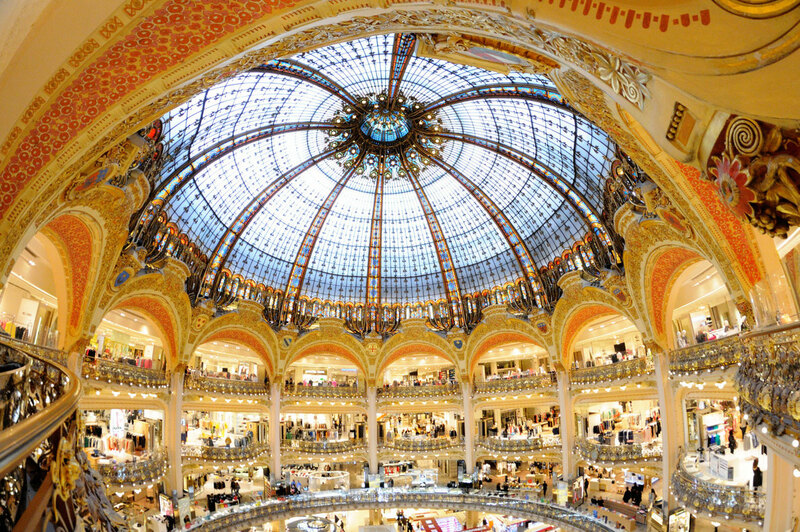 Galeries Lafayette in Paris hosts a popular weekly free fashion show for visitors. (©galerieslafette.com). As soon as it was finished, the Galleria became immediately famous for its large size, extraordinary for the time and sign of a new era. 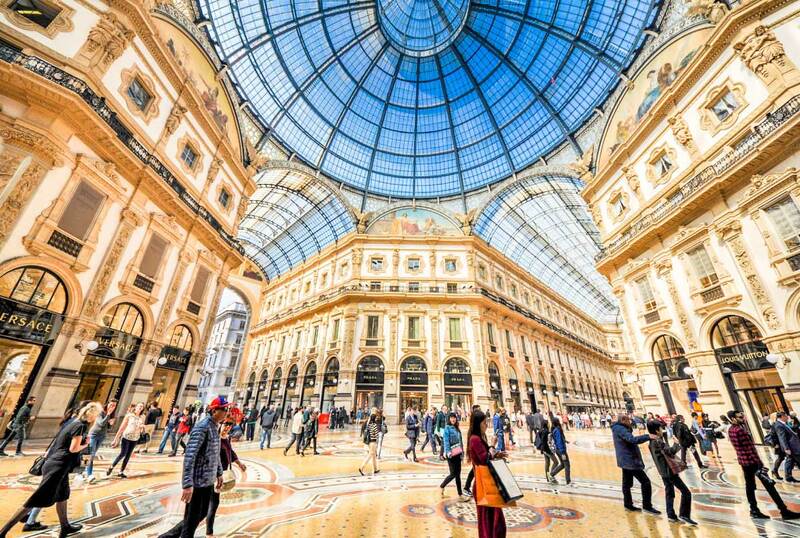 Considered one of the sites of Milanese luxury shopping, along with Via Montenapoleone and Via della Spiga, it hosts many prestigious labels and brand shops, famous cafés and restaurants, as well as Feltrinelli Records, one of the largest megastores in Italy. Harrods is an upmarket department store located in Brompton Road in Knightsbridge, in the Royal Borough of Kensington and Chelsea, London. 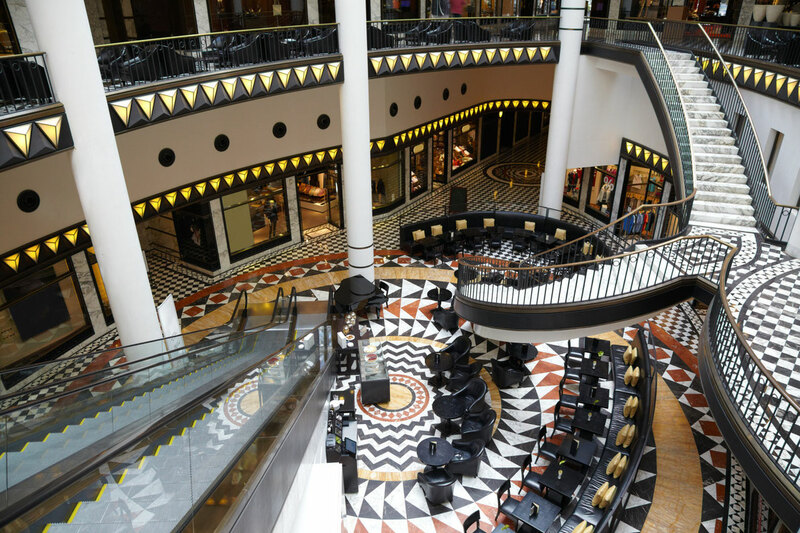 The store occupies a 5-acre (20,000 m2) site and has over one million square feet (90,000 m2) of selling space in over 330 departments making it the biggest department store in Europe. The Harrods motto is Omnia Omnibus Ubique — All Things for All People, Everywhere. Several of its departments, including the seasonal Christmas department and the Food Halls, are world famous. 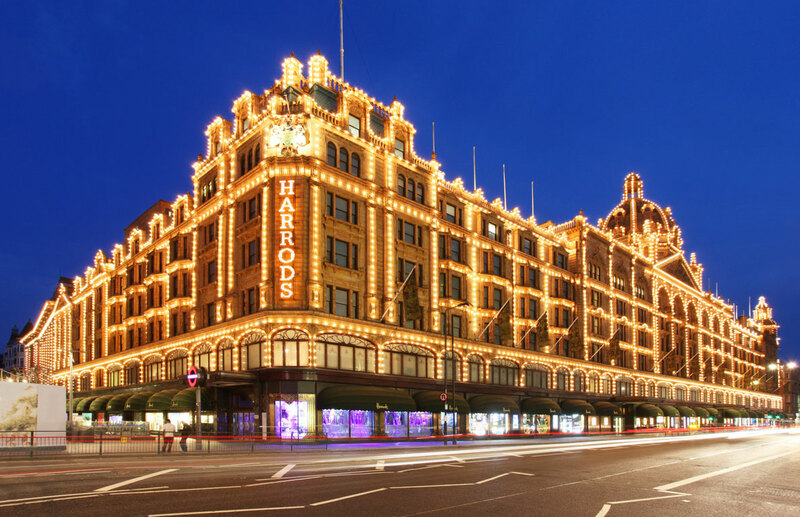 (©harrods.com). 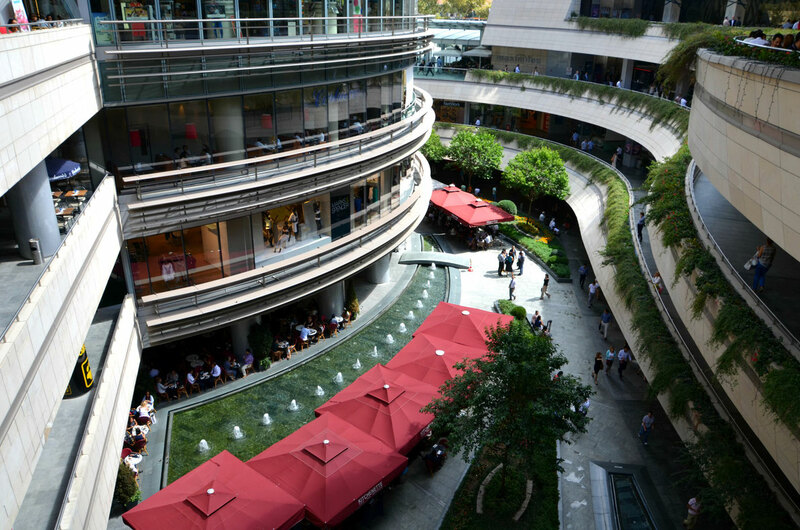 Kanyon (meaning Canyon in Turkish) is a multi-purpose complex located at Büyükdere Avenue No. 185 in the Levent business district of Istanbul, Turkey. Opened on 6 June 2006, it unites a 160-store shopping mall (covering an area of 37,500 m2), a 30-floor office tower (26 floors of which rise above street level) and a 22-floor residential block with 179 residential apartments into a complex undulating around a dramatic architectural “canyon”.The total construction area of the project is 250,000 m2, with 30,000 m2 of rentable office area, 37,500 m2 of rentable retail area, 180 residential flats, 160 stores, 9 theater halls with a capacity of 1,600 spectators, and a parking facility for 2,300 vehicles. Since the end of the 1990s, four teams of star architects have been working on converting four 102-year-old gasometers into a new urban complex. 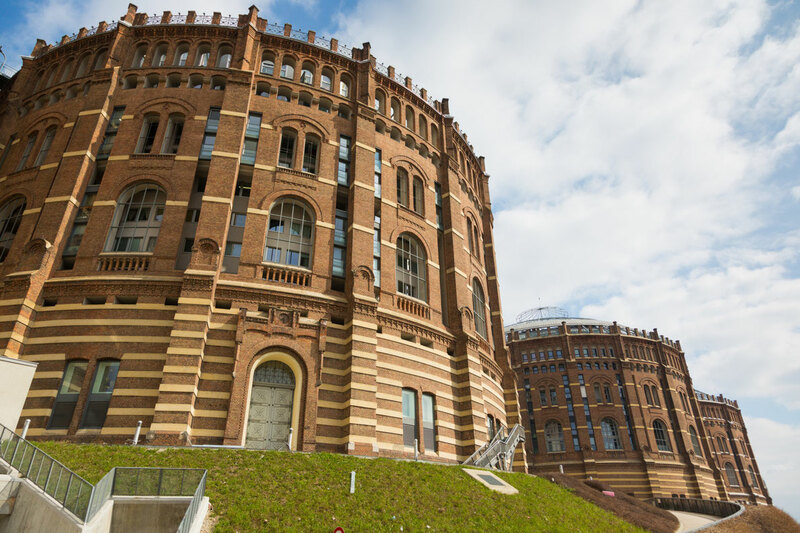 Apart from 615 modern flats and an events hall holding 4,200 people, the 22,000 m2 ground floor of the gasometer complex in the Vienna district of Simmering - once a heavily industrialised area - will also have a shopping mall with some 70 shops. 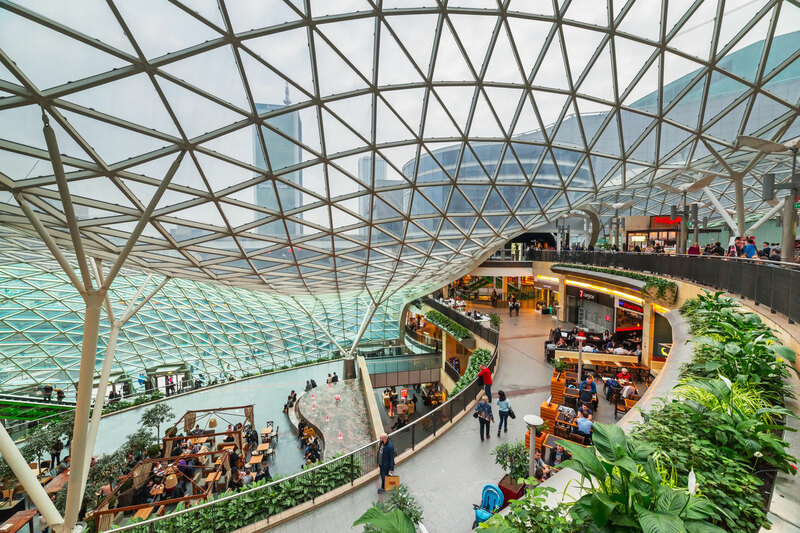 Just eight minutes' away from the city centre (Stephansplatz) on the U3 underground line (station: Gasometer), this new El Dorado offers sheer shopping pleasure in any weather. The gigantic size of this construction project is illustrated by the fact that Vienna's Giant Ferris Wheel would easily fit into each of the four 75-metre high gasometers. 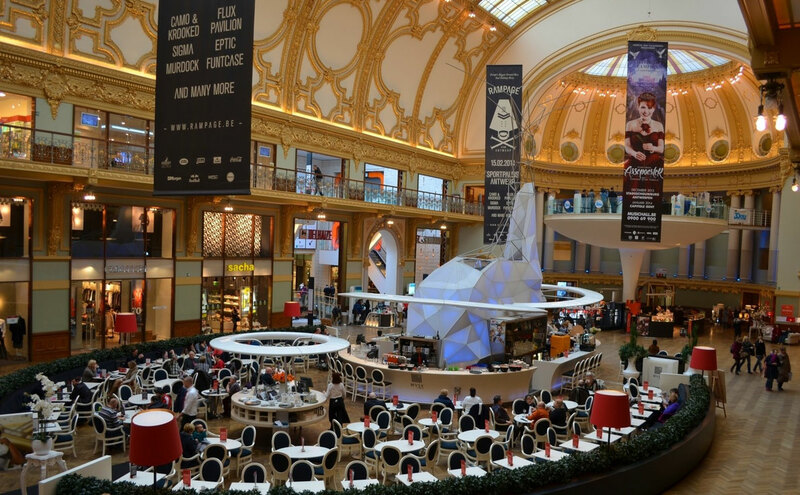 Shopping Stadsfeestzaal has around 40 shops distributed over four levels in the heart of Antwerp. 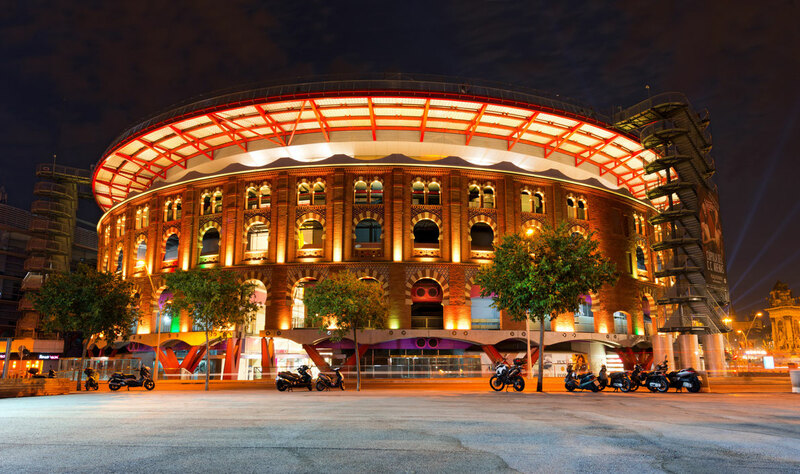 Its mix of amenities includes fashion shops, leisure activities, and food and drink establishments, all accommodated in a unique combination of historical and modern architecture. 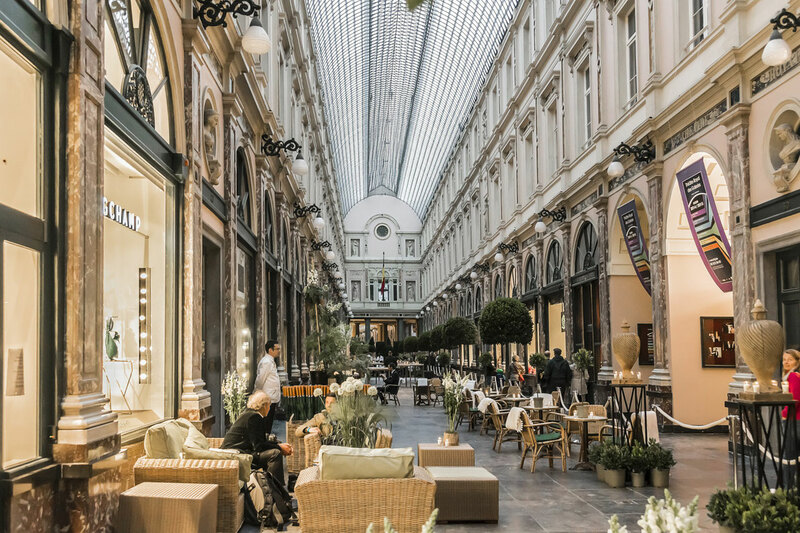 Included in the retail outlets are certain firsts: the first Saturn branch to open in Belgium, the first Urban Outfitters to locate in continental Europe, a pilot store for Tommy Hilfiger and the first COS shop to open in Antwerp. (©stadsfeestzaal). Romantic elements of which, for instance, the Parliament buildings in London are also an example. In 1992 this beautiful building was added to the list of the ten most valuable monuments of the city of Amsterdam. (© magnaplaza.nl). 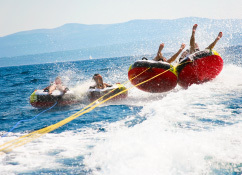 This complex opened in October 2009 includes approximately 160,000 m2 of economic, cultural and leisure activities. The mall is wearing a monumental roof signed Ron Arad. Médiacité partially reinstated the old gallery Longdoz Centre, itself built on the site of the former station Longdoz (destroyed in 1975).